I’ve just been sent an e-mail dis-inviting me from the PSNGB meeting in Leeds. Bit of a shame given that I’d received a confirmation and bought my rail tickets on the strength of that confirmation to travel from Kent to Leeds. I’ve advised a number of local authorities and others on digital infrastructure and public service transformation – Birmingham, Nottingham, Manchester, Leicester. I work with communities on Next Generation Access and chair the NextGen series of events. I was planning to liveblog/tweet the event in Leeds for nothing because I think that the PSNGB stuff should be visible – it’s important to all of us. Anyone else been treated like this? 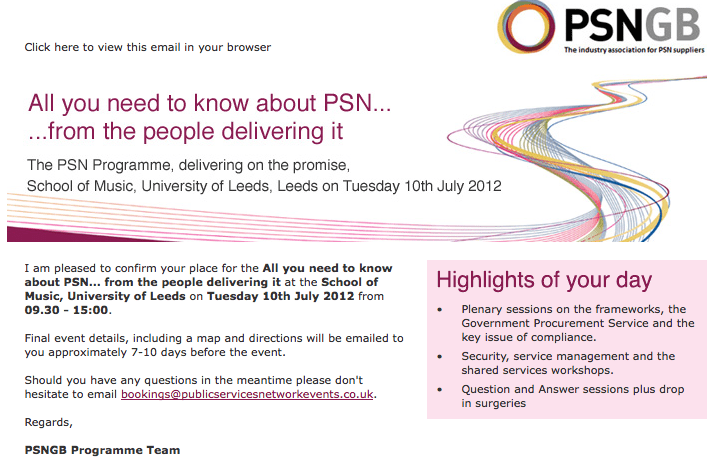 Thank you for your application to attend the PSNGB Roadshow event on 10th or 12th July. Unfortunately demand for places has greatly exceeded supply and we have to prioritise public sector requests followed by PSNGB members, where only one place is available per member organisation. Therefore I am very sorry but on this occasion we are unable to offer you a place. However I would like to extend an invitation to attend a future PSNGB meeting as a guest if your organisation is not already a member. These meetings provide members with the opportunity to participate in the debate around the rapidly evolving PSN market place, to network with other suppliers and to understand how we are developing key areas of the relationship with the PSN Authority and the other public sector stakeholders. Is this another ACTA? closed shop…??? what do they have to hide? Have any others been turned away? Who do we know who’s going who can blog it? What was it Groucho Marx said…? It’s not a closed shop, we have limited spaces unfortunately, and lots more interest that we had spaces. Members are giving up their places to make sure others can attend. We have nothing to hide and will be tweeting from the event and sharing as much information as we can. We are also running more events later in the year so hope all can get to an event somewhere. I’ve looked looked at the list of attendees and can’t see your name. Did you book it in your name or someone else’s? The events are targeted at the Public Sector. We have a waiting list of public sector people wanting to attend. The rooms are filled to capacity. We are asking out own members,who have paying for the event, not to attend in order that we can get as many public sector and government attendees as possible. If you have bought a train ticket, then I’d be pleased to let you have my place. There is nothing closed door about PSNGB, it is open to all of Industry interested in PSN. We would encourage any members of industry to come along, irrespective of size, and see what we are trying to do and join with us to promote PSN, create a marketplace and save the government money. The events will be broadcast on social media and the notes and learnings shared plus there will be further sessions, some may be targeted at Industry, however these, on request of the Cabinet Office, are targeted at the Public Sector. I found you on the list. You were not marked for cancellation. This has been sent in error. Sounds like (from twitter) that they have re-invited you! #poweroftwitter eh? And full marks to them for their speedy response. And for sorting it out so quickly. Have publicly acknowledged your responsiveness on Twitter. Good stuff. It’s good that you have generated lots of demand – this is important stuff and I think it needs to be widely discussed. Thanks for your message – as we’ve discussed on Twitter, the was no indication that the confirmation was conditional so I made travel plans incurring expense.Subsequently, Mike Thomas has told me that the e-mail I got was a mistake. So thank you for sorting it all out.